ST. LOUIS, MO (June 9, 2016) –We are saddened to announce that Mike Ryterski passed away on May 29, 2016, in St. Louis at the age of 96. Admired and respected by his co-workers, Ryterski was known for his wry sense of humor and dedication to Schaeffer Manufacturing Co. Ryterski was one of the few master blenders of lubricants in the world; his expertise was integral to the superior performance of Schaeffer’s products. His ability to formulate new products and maintain quality control enabled Schaeffer to remain at the forefront of specialized lubricant companies throughout the country. Born in 1920, Ryterski grew up and worked on his family’s farm in Tamaroa, Illinois. At the age of 14, he quit school and started raising horses to help his father pay off the farm. In 1941, Ryterski started working for Schaeffer making candles and medical soaps for the Army. He then served in the Army Air Crops during World War II for two years before returning to work for Schaeffer in 1945. When Schaeffer stopped producing soap and candles, Ryterski quickly moved into supervising oil and grease production. He experimented with different formulations and was responsible for creating many of Schaeffer’s proprietary formulas. Ryterski also developed a unique gear-grease to use on dragline, shovels and mills for the mining and steel industries that is still used today. From pouring concrete and building plant additions to installing kettles, tanks and piping, Ryterski’s can-do work ethic and resourcefulness helped him develop Schaeffer’s plant on Barton Street. Not content to sit behind a desk, Ryterski preferred to work on his feet; he simply enjoyed being in the plant he helped build. Ryterski helped grow the plant team from three employees to more than 30 today. He hired his successors Bill Herrmann in the 1973 and Rich Niedbalski in 1984; both worked closely with Ryterski to learn grease manufacturing and plant management. Six plant employees hired by Ryterski in the early ‘70s are still with Schaeffer today. Ryterski retired as a vice president in 1990 but continued to work three or four days a week, sharing his decades of knowledge about lubricants, and helping the plant grow from three employees to more than 30 today. Ryterski was the only resident of his senior community who still had a job. To commemorate Ryterski’s legacy, the company created the Mike Ryterski Lifetime Achievement Award in 2011. The award recognizes associates in the office and plant for their contributions to the company. “The success of Schaeffer is a team effort that relies on all of us,” Ryterski said. “I am honored the company has created this tribute for our employees.” Impressively, four employees hired by Ryterski have earned this award. Ryterski was selected as one of 100 semifinalists considered as a 2010 inductee for the Energizer Keep Going Hall of Fame. 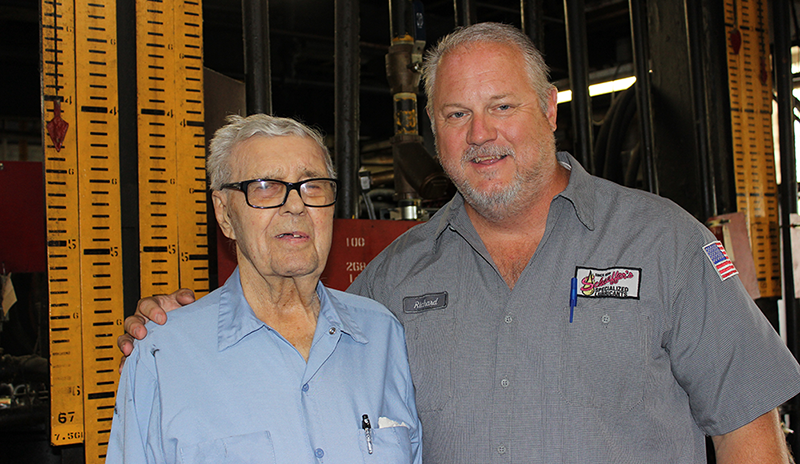 In 2011 while celebrating 70 years of employment, Ryterksi was named the St. Louis region’s oldest worker in the 20th annual Missouri Older Worker of the Year contest sponsored by MERS/Goodwill. In the Schaeffer spirit of family and tradition, Team Schaeffer stands on the shoulders of those who came before us, and we all stand on Ryterski’s shoulders. As we walk through the plant and make grease, we are reminded of all the ways Ryterski shaped our product line and shared his knowledge with our team.